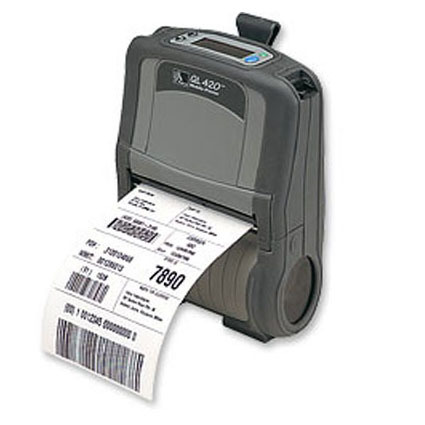 The QL 420 direct thermal mobile printer has been designed with the most advanced technology in rubber-infused over-molding to maintain both rugged construction and minimal weight. With center-loading media, smart battery monitoring, and an optional LCD, it provides user-friendly options to keep your business moving. The Zebra QL420 has been discontinued. It´s replacement is the Zebra QL420 Plus. The QL 420´s QuickLink modules, in IrDA, Bluetooth, or 802.11b, offer the flexibility to adjust to a wide range of connectivity needs. As needs change, so can QuickLink modules. In addition, the QL 420 is cable-ready and offers cables to connect to a wider variety of terminals than any other mobile printer. Maximum label and liner width: 2" to 4.12"
Core diameter: Interchangeable .75" or 1.38"